Disaster relief feeding units were activated and chainsaw teams were being called in as one in three Oklahoma residents were without electrical power Dec. 11 following a widespread ice storm that continued to overwhelm the Midwest. At least 22 deaths had been attributed to the storm, and states of emergency were declared in Missouri, Kansas and Oklahoma. By Tuesday, the storm had moved into Iowa. More than 600,000 customers were without electricity in Oklahoma since Dec. 10, when trees began snapping under the weight of the ice, bringing down power lines. The offices of the Missouri Baptist Convention in Jefferson City were closed Dec. 10-11 because of the ice. The offices of the Baptist General Convention of Oklahoma were closed Dec. 10 as well. 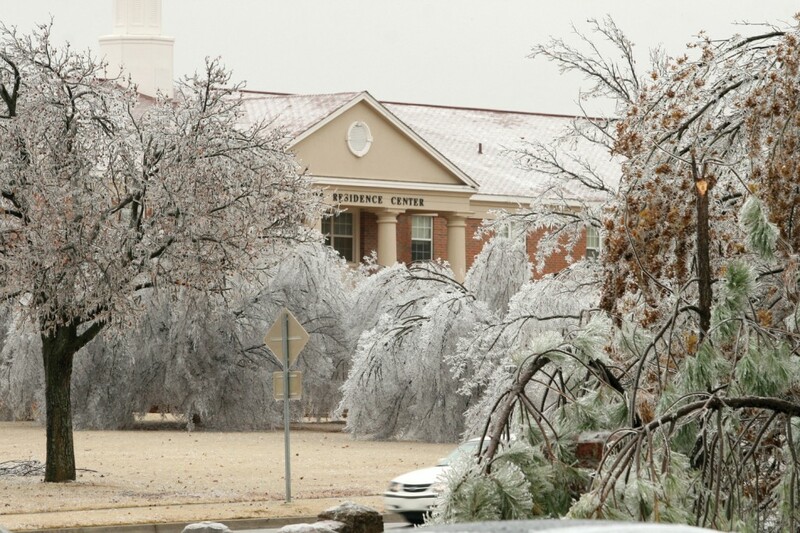 Officials at Oklahoma Baptist University in Shawnee did not cancel classes, and students were asked to use caution as they made their way to campus for final exams. The university expected to lose several trees to the ice storm, which reminded longtime residents of a similar disaster in 1979 that claimed 100 trees. “It’s the biggest loss since that storm,” Johnny Cullison, OBU’s administrator emeritus, who worked at the university from 1970 until he retired in 2003, said of the current situation, according to the school’s Web site. Tulsa, First housed 270 people during the night of Dec. 10, according to Pastor Deron Spoo. “Walking through this morning, there are quite a few families with little kids, and that breaks your heart to see that happening,” Spoo told Baptist Press. The downtown church is serving as a Red Cross shelter, as it has done during previous ice storms. “By virtue of our power lines being underground, we’re still up and running, and I think it would be wrong not to use our facility,” Spoo said, adding that his family didn’t have electricity at their home. “We do have a small gas fireplace, so we all huddled in front of that last night and did just fine,” he said. Spoo said the overall demeanor of the people seeking shelter at the church, including some stranded Greyhound bus passengers, was positive. “More than one person this morning thanked me profusely for using our facilities. There’s a wonderful sense of gratitude,” he said. “I think people are just happy to be out of the cold. The church runs devotional spots on local television stations, and Spoo said several evacuees indicated they recognized the church from the commercials. Terry Henderson, national disaster relief director with the North American Mission Board, told Baptist Press he expected Missouri to activate emergency response teams as soon as road conditions allowed.